Canon zoom lens; photo credit: Morguefiles. Rita Gardner at home in California. My guest this month is 67-year-old Rita Gardner, who grew up on her expatriate family’s coconut farm in a remote seaside village in the Dominican Republic. Her father declared them to be the luckiest people on earth. In reality, the family was in the path of hurricanes and in the grip of a brutal dictator, Rafael Trujillo. But if life was far from the Eden her father had envisioned, Rita developed a set of childhood passions that sustains her to this day: writing, traveling, hiking—and photography. She may no longer live in the Dominican Republic but she continues to dream in Spanish, dance the merengue, and gather inspiration from nature and the ocean. Her favorite color is Caribbean blue. And now Rita has written a memoir about her life as a Third Culture Kid in República Dominicana. 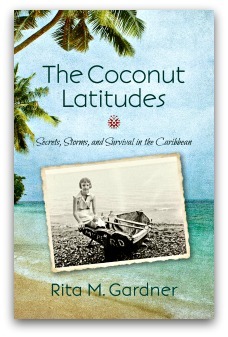 Due out from She Writes Press in September, the book is evocatively titled The Coconut Latitudes: Secrets, Storms and Survival in the Caribbean. Rita contacted me because she is enjoying “A Picture Says…” I am pleased that she can be this month’s featured guest. Hi, Rita, and welcome to the Displaced Nation. I’m delighted to hear you’re enjoying “A Picture Says…” and to have the opportunity to do this interview. Before we get down to the nitty gritty, can you tell me a little more about how your family ended up living in the Caribbean? My father was an electrical engineer and traveled all over the world installing hydro-electric dams. I think my travel wings must have sprouted in the womb since my parents were in Uruguay on a job site when my mother got pregnant. They flew back to the U.S. so I could be born, and six weeks later we were on another plane, this time to an engineering job in the Dominican Republic. My parents fell in love with that Caribbean island nation, and my father quit his engineering job and “went off the grid” to become a coconut farmer on an isolated beach on the country’s northern coast. It became our permanent home for the next 19 years, and, as you already mentioned, our Caribbean life is the subject of my forthcoming memoir, The Coconut Latitudes. I guess that being born into an expat family was a passport, so to speak, to a life of travel? That’s true. It influenced me in other ways as well. I tend to travel “close to the ground,” getting to know the people where I’m visiting. I also travel light as I want to be free to immerse myself (to the extent possible) in other cultures, exploring commonalities as well as differences. Most of my travels have been within Latin America, where I’ve been able to put my Spanish-language skills to use. And I gather that growing up where you did, on a Caribbean island, you sometimes encountered real adventurers? Did they inspire you as well? Yes. Those who made it as far as our isolated coconut farm were pretty intrepid and would have stories to tell. Because they were so rare, these visitors made a big impression on me, and their stories made me thirst for the day when I could venture out into the wider world myself. In my new memoir I chronicle one such encounter with a group of strangers who shipwrecked near our farm, and turned out to be not who they appeared to be. Someone else who inspired me was my older sister. By the time she was in her fifties, she’d traveled to over seventy countries. Wow, she does sound adventuresome. How about you—which countries have you visited? Most of the islands in the Caribbean, several of them by sailboat, plus Mexico, Costa Rica, Argentina, and Uruguay. In Europe I’ve been to Italy (where I attempted to speak Italian but it came out Spanish), France, and Greece (island-hopping by small boat plus a side trip to Athens). South America is a part of the world I have never been but the three weeks I spent in Trinidad more than thirty years ago gave me an idea of what it may be like. I’m sure you have some wonderful memories and I look forward to reading them soon in The Coconut Latitudes. I see you now live in North America. Can you tell us where? I’m in northern California, right on San Francisco Bay. I found my way here a few decades ago. I’ve always chosen to live near the ocean. Like most people, I had to earn a living, so travel was only an option during vacations. Luckily, I’ve recently retired so have more to time to travel, take pictures, and write. The smoking bride; photo credit: Rita M. Gardner. Wading chairs; photo credit: Rita M. Gardner. A sitting duck; photo credit: Rita M. Gardner. Speaking of taking pictures, let’s have a look at a few in your collection that capture favorite memories. Can you describe the story behind each one and what makes them so special? I visited France for the first time last year with a dear friend, and one of our favorite things to do was meander about. 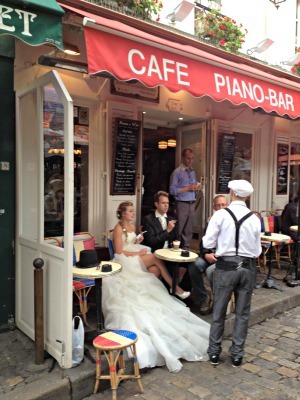 We saw this bridal couple in Monmartre. The bride’s leg-baring gown and the cigarette struck me as being improper yet fun. She obviously stepped out of the part for a while, which makes for a lovely scene—almost like an actor taking a break on a film set. What else do you have for us? The next one is from Boca Chica Beach, in the Dominican Republic, whose pastel turquoise waters I had loved since the time I was a small child. I recently went back to the Dominican Republic to attend a friend’s mother’s 100th birthday party. A group of us decided to pay a visit to this beach. 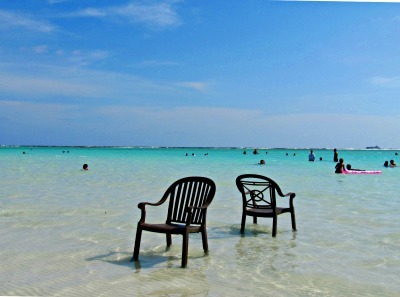 I liked the whimsy of the chairs in the shallows, as if they were bathing. So you didn’t put the chairs there yourself? 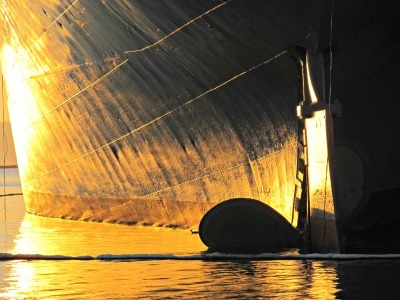 That may not be such a small duck but it certainly is a big ship. And now can you share some examples of your favorite places to take photographs? What is it about these places that inspires you? It’s a bit of a mixture really. One of my favorite subjects is nature. Growing up on a Caribbean island, I saw the entire range, from watching in awe as thundering waves destroyed our pier and pitch-poled fishing boats, to contemplating sunsets that painted calm seas with exuberant color, to enjoying the deep chorus of frogs announcing rain. To this day, I love to take pictures out of doors. I enjoy finding unusual patterns in nature and looking for images that are “hidden in plain sight.” My other favorite subject is people: I am endlessly curious. Sometimes I plunge into crowds in hopes of getting opportunities for candid people shots. 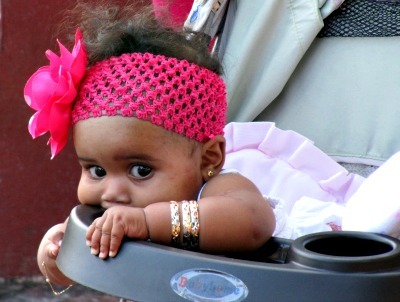 This photo was taken in the midst of a parade in Santo Domingo, where the child’s attention was riveted to the action beyond the scene. Out of this displaced world; photo credit: Rita M. Gardner. I took the next photo, of leaf patterns, at nearby Phoenix Lake during a hike with friends. I love the variety of colors and shapes. 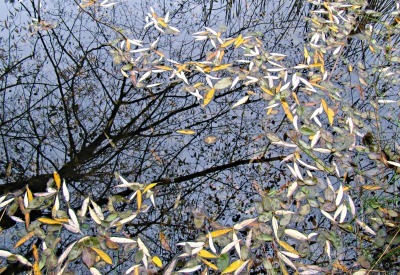 Leaf patterns; photo credit: Rita M. Gardner. This third photo, taking in Mykonos, combines my love of nature and people. It feels meditative to me; clearly the fisherman is at one with his environment. Fishing for serenity of mind; photo credit: Rita M. Gardner. 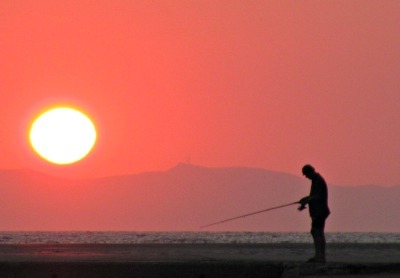 I particularly love the fisherman shot because I have had many wonderful holidays in Mykonos, where I’ve taken photos—but never witnessed a scene like this one. In fact it is one that most people would not associate with Mykonos. Moving on, I know some people feel reserved about taking photos of people, particularly when they are conscious that they are doing so. What’s your feeling about this? I feel respect more than reserve, and if it seems that taking pictures would not be a welcome experience, I back away from doing it. In that case, do you ask permission before taking people’s photographs? And how do you get around any problem of language? I’m a pretty friendly person, so if I’ve caught someone’s eye,I might engage them in a brief conversation and ask if it’s OK if I take their picture. I find smiles break through a lot of language barriers. Also, most people I meet like to practice their English, so language is not usually a problem. That said, some of the best photos are candid ones. Sometimes I try to capture a shot without the subject being aware—I don’t engage in conversation in those instances. Would you say that photography and the ability to be able to capture something unique which will never be seen again is a powerful force for you and has changed the way you look at life? I consider myself extremely lucky when I’ve managed to capture an image that is unusual and unlikely to be photographed again. I don’t think the experience changes me. My chief emotion is to feel grateful that I have an eye for images that others may lack. Photographers never tire of discussing cameras and lenses. What kind of equipment do you use? I gave up my SLR and its array of lenses for the convenience of a small digital camera. I use a Canon PowerShot and my i-Phone. Both fit in pockets, so I can travel light. Also, I prefer to shoot in natural light rather than use a flash (unless it’s absolutely necessary). So I guess I could say I travel light, and I shoot “light.” How’s that for a quick summary of my style? Well said! I see nothing wrong with using smaller cameras. Their power and versatility is improving all the time, so unless you need big images for printing they do a great job, sufficient for posting on websites and social media. What is your take on post-processing? I don’t manipulate my photos other than with the standard tools for cropping, adjusting exposure, etc. I don’t use Photoshop or any the other software products available. Okay, I have to confess I just discovered some apps for the i-Phone camera which I’m having fun with, but mostly “what I see is what I get.” That said, I’m not a purist; I may get into photo software at some point in the future. The results are good so don’t tell anyone!!! Finally, do you have any advice from your experiences for wannabe photographers who are traveling or living abroad? Given the ability to erase unwanted images on digital cameras, just shoot away, assuming you get a photo card with enough memory that it doesn’t fill up quickly. Always carry an extra battery and extra film card, because it does you no good to have those items tucked away in your suitcase, or wherever you are lodging! Oh, and do have a battery charger if you are on a long trip so you don’t have to worry about running out of juice. So to speak. Thanks so much for all these practical tips and for sharing these photos, Rita, and may I take this opportunity to wish you the very best when you launch The Coconut Latitudes this coming month. 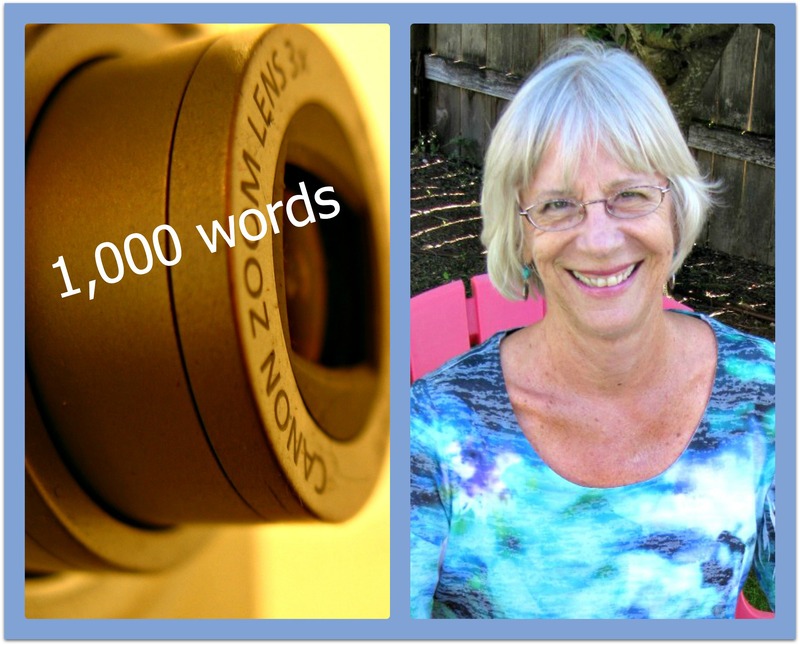 Readers, what do you make of Rita’s experiences and her photography advice? And do you have any questions for her on her photos and/or travels? Please leave them in the comments! And if you want to know more about Rita, don’t forget to visit her author site and like her author page on Facebook. You can also follow her on Twitter and Pinterest. Last but not least, I would highly recommend that you pre-order a copy of Rita’s Dominican memoir, The Coconut Latitudes, from Amazon. Seems like a good read. Hopefully there’ll be a Kindle version. Hello – Thanks for your note. Yes, the Kindle version will be available next week! (September 16). I hope you enjoy it, and I’d love to hear your feedback. Great. I’ll definitely add it to Amazon. If it’s on goodreads, I’ll add it to my to-read shelf too. I thought I had commented last month on this interesting post about an interesting lady. Rita, your life parallels mine and reminds me of friends whose fathers worked for Standard Fruit ( or some such co.). I’ll look forward to your book – keep us posted. Thanks, Cinda – I don’t recall seeing the earlier comment. Much appreciated!